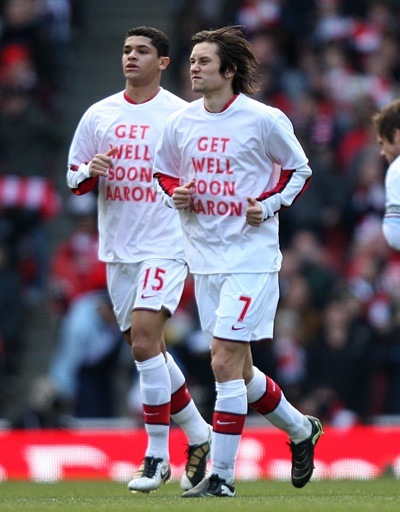 Before today’s match against Burnley at the Emirates, Arsenal players sported special ‘Get Well Soon Aaron’ T-shirts in support of stricken team-mate Aaron Ramsey. It’s also a case now of ‘Get Well Soon Cesc’, as Senor Fabregas was subbed off before half-time with a suspected hamstring tweak. 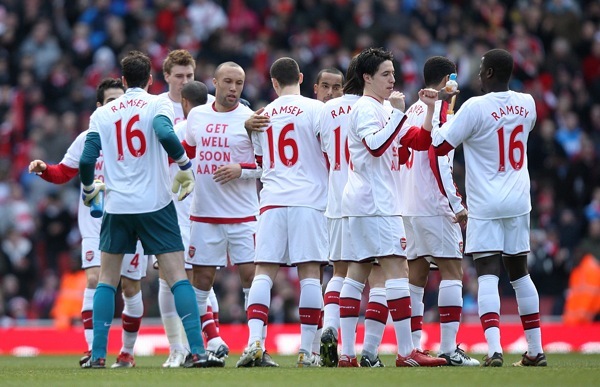 Good to see all the team wearing these shirts of in respect of aaron. Take a look at these Signed Arsenal Shirts there is a great selection. This is a great support by his team-mate. Get well soon Ramsey. Great Spirit for The Young Gun.